Initialize communication with the founded ECU. 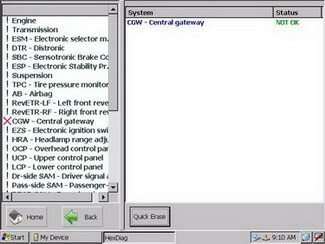 Tests if this ECU is Faulty. Report the status of this ECU. (V) For (NO fault codes). (X) For (with fault codes). (!) 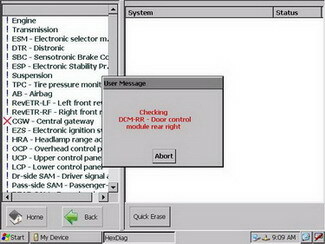 The system cannot be found in current car or ECU is malfunction. Autohex Scan Tool Mercedes Benz software detects all Mercedes Benz ECUs (electronic control units) installed in car and reads all diagnostic fault codes. (Quick Erase) is a function used to make bulk erase all faults in the car at once; by hitting the (Quick Erase) button you will erase fault codes of all the faulted systems in Mercedes Ben Car. After using (Quick Erase) function, the faulted systems on the left menu will move to the right menu, if the system still has fault codes its status will be (NOT OK) otherwise it becomes (OK). By clicking each function, you will see in the right menu the information included under each function.